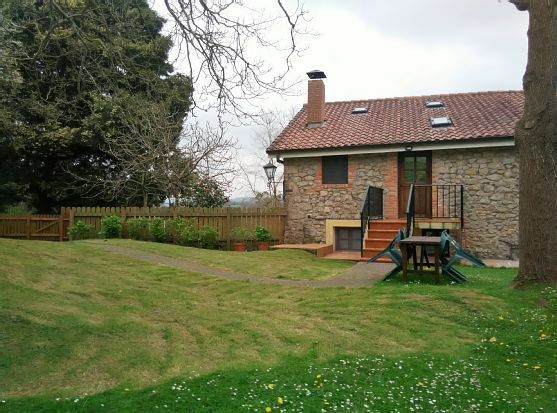 Casa Migegos is a charming cottage built of stone and wood, lovingly restored in one of the most sought after areas by rural tourists in the west coast of Cantabria (Northern Spain). Located in the village of La Revilla, in the heart of the Oyambre Natural Park, the cottage is a place where you can enjoy silence and unforgettable days while being a central location to experience the incredible rich history of the region. La Revilla is situated at an altitude of 25 meters above sea level, on National Highway 634 at Mirador de la Pita. This location offers a stunning panoramic view of the Ria de San Vicente de la Barquera, with the Marisma de Rubin and the Picos de Europa in the background. Quaint nearby towns include San Vicente de la Barquera, Comillas and Santillana del Mar. A 5 minute walk from the cottage is an 18-hole golf course, Campo de Golf Santa Marina, designed by Severiano Ballesteros. San Vicente de la Barquera is 3 kms away - a lovely old town renowned for its tradition, history, white sand beaches and famous cuisine centered around the fishing port's daily seafood catch. •	Migegos I has 3 double bedrooms, bathroom, kitchen, large living room with fireplace and garden with barbecue. •	Migegos II has 2 double bedrooms, bathroom, kitchen, lounge and garden with barbecue.